Born in Blois, France. Born Jean-Eugene Robert. Soon after his marriage to Cecile Houdin in 1830, he adopted 'Robert-Houdin' as his stage name and had it legalized on 10th September 1856. Apprenticed as a watchmaker in Blois, he learned magic c1827 from accidental purchase of the 2-volume 1792 edition of the Dictionnarie Encyclopedie des Amusements des Sciences, Mathematiques et Physiques , which included tricks copied from Ozanam, Guyot, Decremps, Pinetti, etc. Claimed he had received advanced lessons in 1829 from Torrini. Pro illusionist and sleight-of-hand artist. 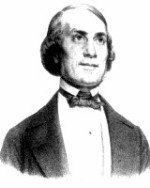 Founder-owner-director Theatre Robert-Houdin in Paris 1845-1852 when he passed it to his brother-in-law, Hamilton, although continuing to perform there until retired in 1854. Called 'The Father of Modern Magic' since as early as 1909 (by Hilliard). Had played Belgium (1846, 1849, 1853), London (1848 and 1853), Germany (1853, twice), and Algeria (1856), the last bringing him out of retirement at the request of the French government. A prolific inventor, including The Orange Tree (1845), Light and Heavy Chest (1845), Shower of Plumes (1845), Le carton fantastique (1848), Aerial Suspension (1849), Diavolo Antonio (1849), and possibly both silent code (1849) and Stop Trick. The original title is Les Secrets de la Prestidigitation et de la Magie . It was the collection of lessons and information Robert-Houdin intended to teach his sons to make them expert magicians. However, his sons did have other interests, mechanics and military, which led him to publish his recordings as book. Prof. Hoffmann has translated this masterpiece into English.